This slot game from Novomatic is pretty basic but it does have a unique theme! It’s a slot game that will be loved by any player who’s music crazy (and doesn’t play with their slot on mute). Music Island has 5 reels and 4 rows. What’s more, Music Island has a whopping 50 paylines! These paylines are always active which means that you’ll always have 50 ways to win! The minimum bet per line is 0.01 so you have a minimum bet of 0.50 per spin on this slot. This isn’t too bad but it might put off some of you who like to play slots with very small bets. The whole design of the slot will remind you of a retro disco, complete with all the lights and the mirror disco balls! Music Island is filled with traditional slot symbols but they have their own unique, musical twist! There are bells and cherries and sevens and stars and each has their own musical persona. You can get wins in Musical Island by matching up symbols along paylines. The slot has a paytable that explains all the rules and shows all of the wins for each of the symbols. There aren’t any Free Games in Music Island, which puts it behind many other Novomatic slots in terms of features. However, the musical theme really is something else! There also isn’t a gamble option in this game which a lot of players really love. However, Music Island can be played in automatic mode using the autoplay feature. The RTP of 96.04% makes this slot one of Novomatic’s better paying slot games. Symbols, not cymbals! 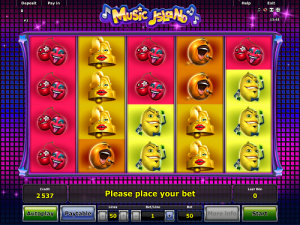 There are 8 symbols in total in Music Island, all of which pay when you match x3, x4 or x5 of them across a payline, starting from the left and following the payline on consecutive reels. At the lower end of the paytable are the fruits. To start with, you’ll find the rock chick cherries! These pay out as much as the jazzy lemon and the opera orange! The rapper plum and the reggae watermelon pay out double the other three fruits. The golden bell, who looks a lot like Marylin Monroe, pays out double the high-paying fruits! The red seven, however, pays out more than triple the golden bell. This symbol is an Elvis impersonator uh-huh! Finally, the golden star Scatter symbol is by far the highest-paying symbol in the game. It can pay up to x500 your bet! The best thing about this golden star is that he represents a real one – Michael Jackson himself! Open up the paytable to see how much you’ll get for x3, x4 and x5 matches of these symbols according to your bet. The paytable will change when your bet changes, so you’ll always be able to see the exact payout figures that are relevant to you. This is one good thing about Novomatic slot games. As well, when you do spin a winning combination, the game clearly shows you which symbols were the winners and how much you won. Not all other developers show this very clearly in their games and they can be a bit confusing to play. The only thing that you’ll feel missing after a win is the gamble feature, as this Novomatic slot game doesn’t have one. It’s pretty standard for a slot game to have a few special symbols or features, especially if it’s not a plain 3x3 slot. Music Island does not disappoint! The red seven symbol pays out like the others but it can also be the others! That’s right: Mr Elvis can impersonate any of the other musical symbols! Elvis can fill in for anyone and help you hit those high notes. Every time a winning combination lands on the reels, you’ll be treated to a mini concert and the music you hear will depend on which symbol is giving you the payout! The star, Michael Jackson, is a Scatter symbol. This means that the King of Pop can land on absolutely any three, four or five positions on the reels and he’ll still give you a win! Michael Jackson doesn’t conform to paylines! Lastly, before the music stops, let us tell you about one final feature. The red seven can give out an extra special payout. It’s quite like a jackpot in that the winning sum is so huge! In fact, this payout equals 2000x your bet! To win this much, you will need to fill all four positions on all five reels with the red seven, Mr. Elvis Presley. Thank you very much!